Collecting padlocks from China has become more of a possibility for the average collector since the early 1980's when China started opening its doors to the West. Over the past 25 years large increases in tourism to China and export of Chinese goods to the U.S., has made the supply of Chines art and handcrafts more readily available. 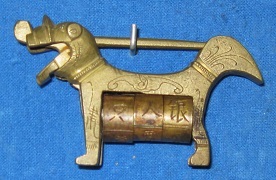 In addition, since the late 1990's the use of computer based Internet auctions, such as EBAY, has further enhanced the ability of a collector to acquire Chinese padlocks. 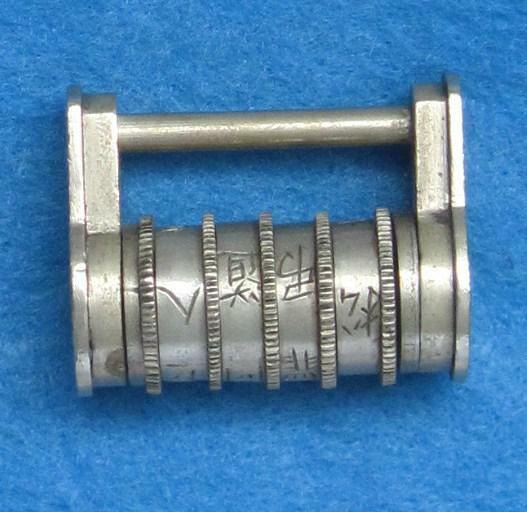 There are numerous types of collectible padlocks available from China, both antique and new (replicas). 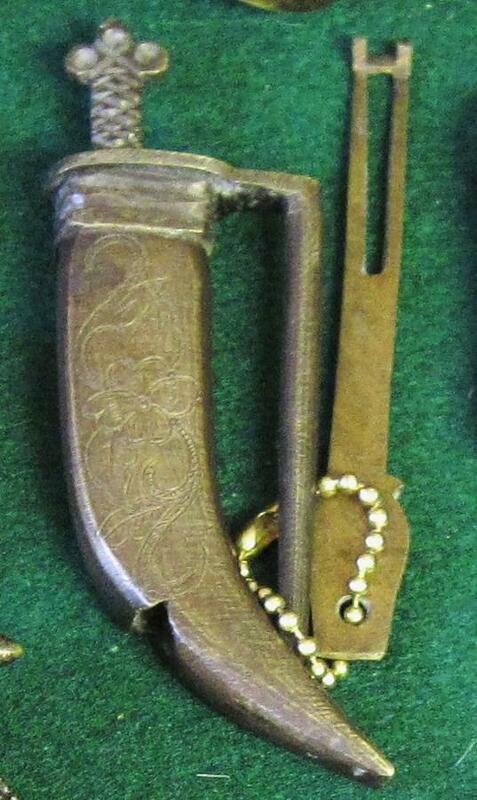 The antique padlocks are fairly scarce, even though the same styles have been made in China for centuries. The new, or post World War II, padlocks are prolific and now easy to find. The craft of making locks by casting has survived in China to this day. The new padlocks are sold evidently at all markets in China and are also readily exported around the world. 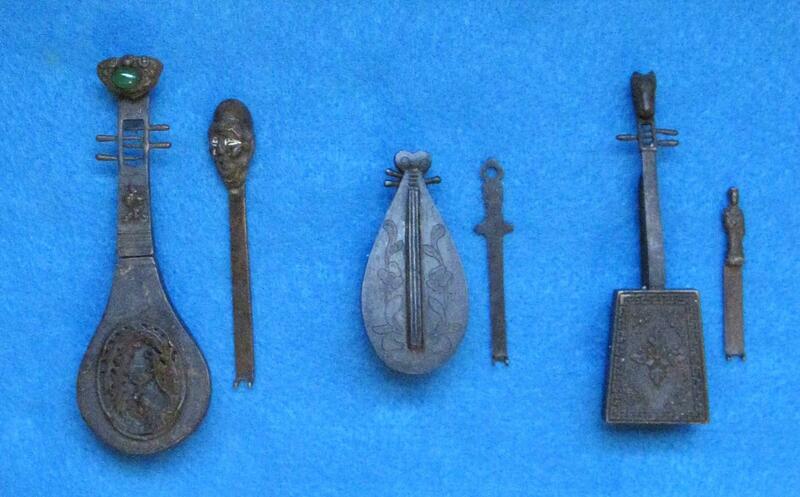 They are attractive curiosities to collect and many times even come with ornately cast keys. 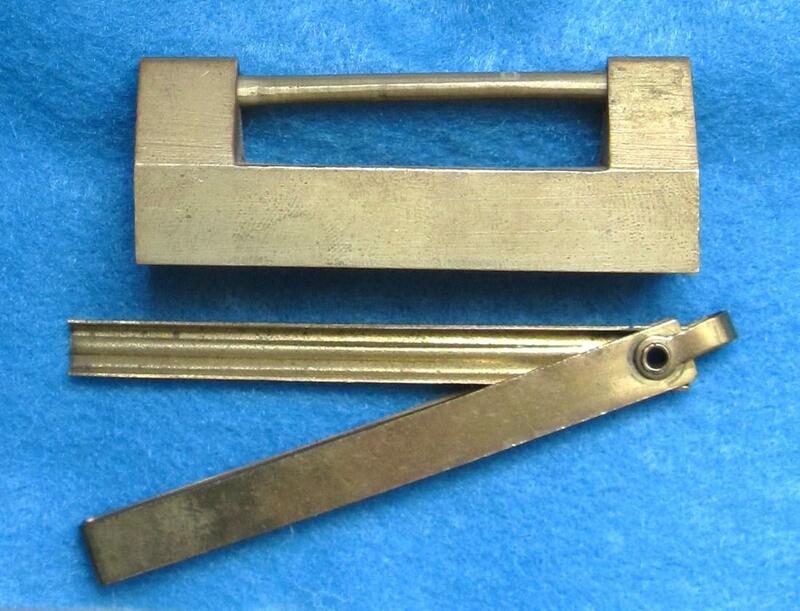 Most of these padlocks usually incorporate a single and very ancient locking mechanism that uses a leaf spring and a specially made sliding key (Figure 1). Combination letter locks are also popular. 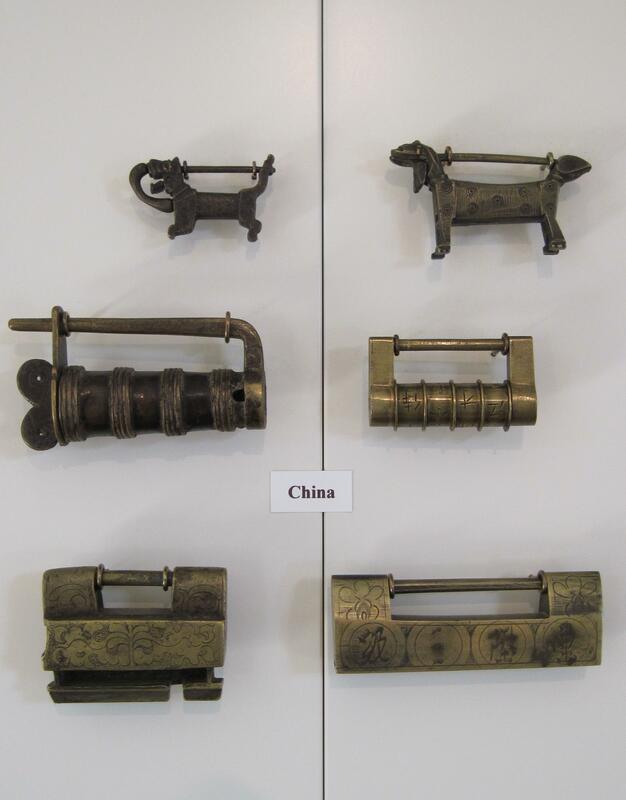 The modern Chinese padlocks are not only made for the tourist trade as decorative souvenirs but are also produced for utilitarian purposes such as for use on Chinese style chests and cabinets. The new Chinese padlocks resembling antique designs can be categorized into three major varieties: Figural padlocks, box style padlocks, and combination letter locks. 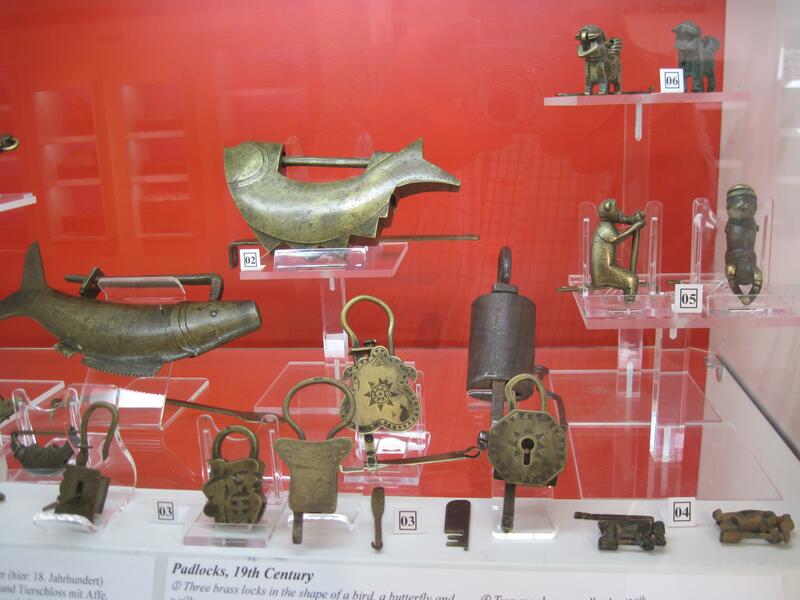 The figural padlocks are perhaps the most diverse in form, since they can take the shape of almost anything, such as animals, human figures, musical instruments, signs of the Chinese zodiac, and even ancient Chinese language characters (Figures 2-6). The box style padlocks come in both highly decorated designs or simple basic forms (Figures 7-9). 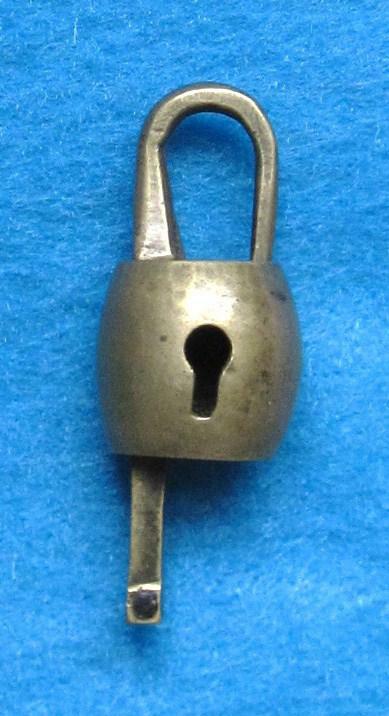 To add more diversity in collecting, there are box locks that have a secret key hole, These are a bit more scarce to find, but worth the hunt and extra cost (Figure 10). 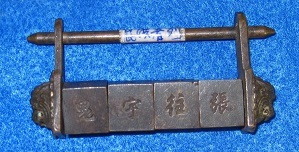 Chinese letter combination padlocks are also found in attractive and unusual designs (Figures 11-12). 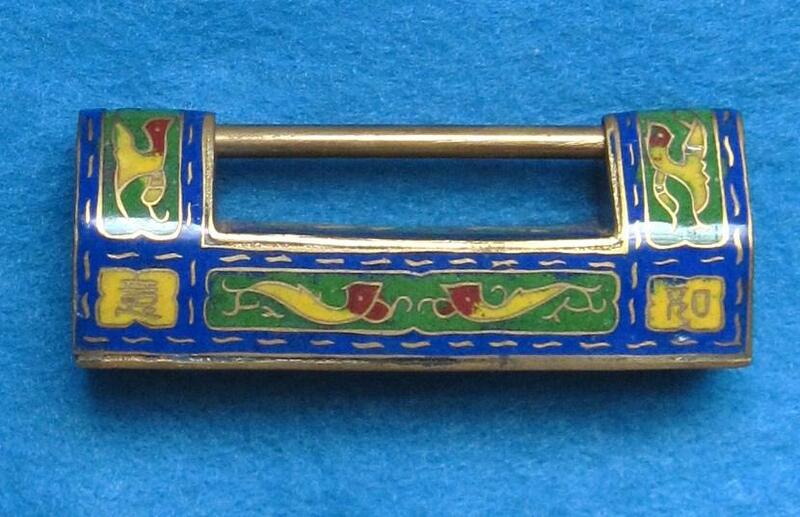 Collecting Chinese padlocks is fun and interesting, since they are unusual, attractive, and diverse in design. They are usually available for reasonable prices, at $8.00-15.00 for small ones, and $20-$50 for the larger padlocks. Occasionally you may find a true antique example. Beware though, because many sources of these padlocks advertise them as being old, vintage, or antique. Most are not, and trying to tell the difference between truly antique Chinese padlocks and the new imitations is difficult without experience. The new padlocks are often brass and are â€œdoctored upâ€ to look like really old objects by the use of chemicals to produce an artificial patina; they are made using casting processes that resemble their real antique counterparts. 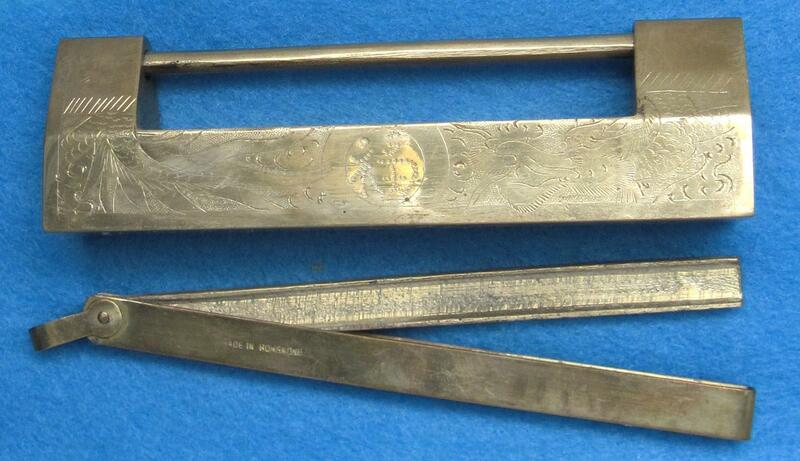 Unless you have handled both the new and true antique padlocks, it will be hard to recognized the true antiques. If you are thinking of spending a lot of money on a reputed antique Chinese padlock, first consult with an experienced collector and get a second opinion. 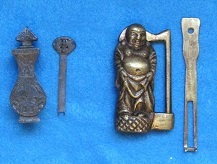 Figures 8, 9, and 13 show examples of older Chinese padlocks, most likely late 19th or early 20th century. They are slightly better crafted and are made of more precious metals such as nickel silver or even silver. 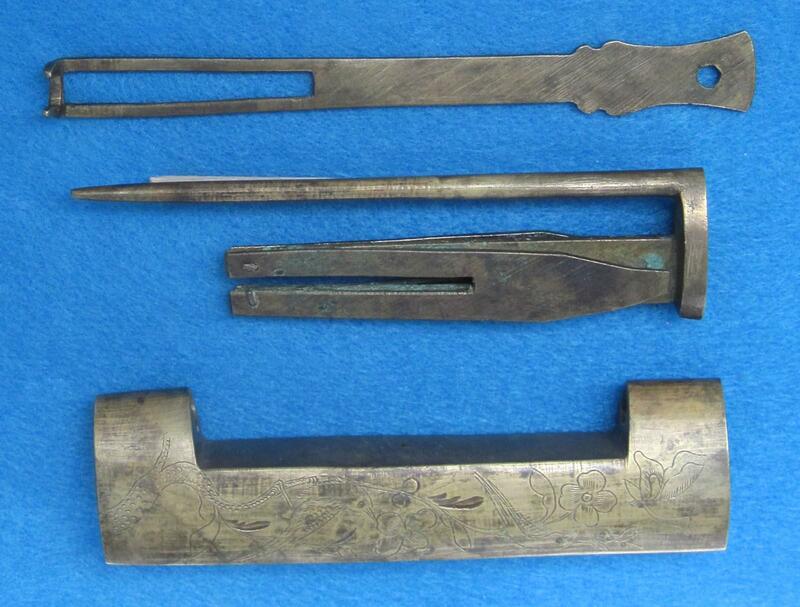 Also, some of the older Chinese padlocks may be recognized by their more austere and utilitarian design (Figure 14). One of the best ways to gain the knowledge necessary to help distinguish between the new and antique Chinese padlocks is by examining other collections. This can be easily done by reading books about antique padlocks. Many of these books are old and out of print, thus very hard to find. However, there is currently an excellent book available (usually on EBAY) from the Hanns Schell Lock Museum in Graz, Austria. 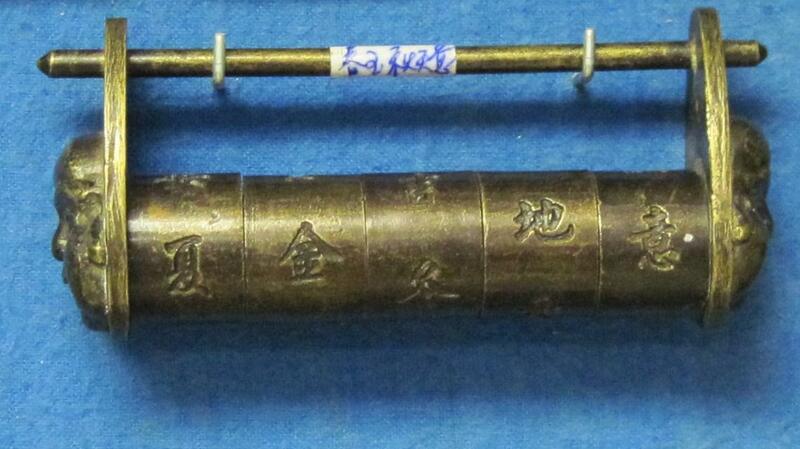 Published by the museum, the book is a very good reference for both European and Asian antique locks. Figures 15 and 16 show examples of the many padlocks that are shown in this book. 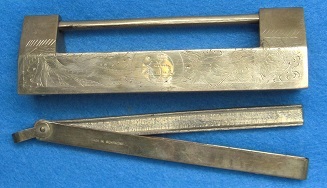 The Schell Lock museum may be contacted using their website: http://schell-collection.com and more information about antique lock collecting can be obtained from Richard Chenovick (rchenovick@juno.com) who sells new and old book reprints on lock collecting. Figure 1. 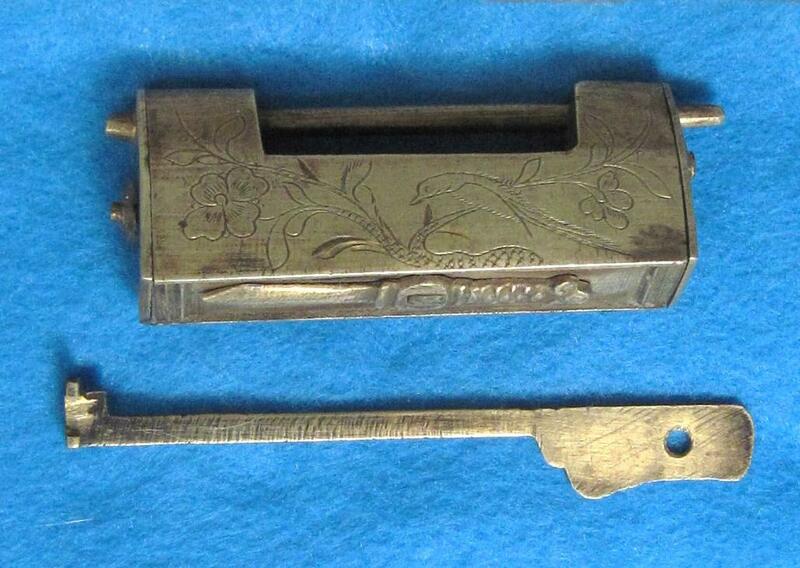 Chinese box style padlock showing leaf spring locking mechanism and key. Figure 2. 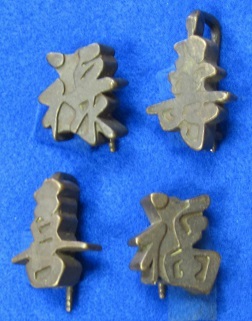 Chinese figural padlocks in shape of a crab, turtle, and fish. Figure 3. Figural Chinese padlocks: Vase, Buddha and Daggar in a Sheath. Figure 4. 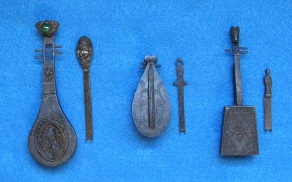 Figural padlocks in the shape of various Chinese string instruments. Figure 5. 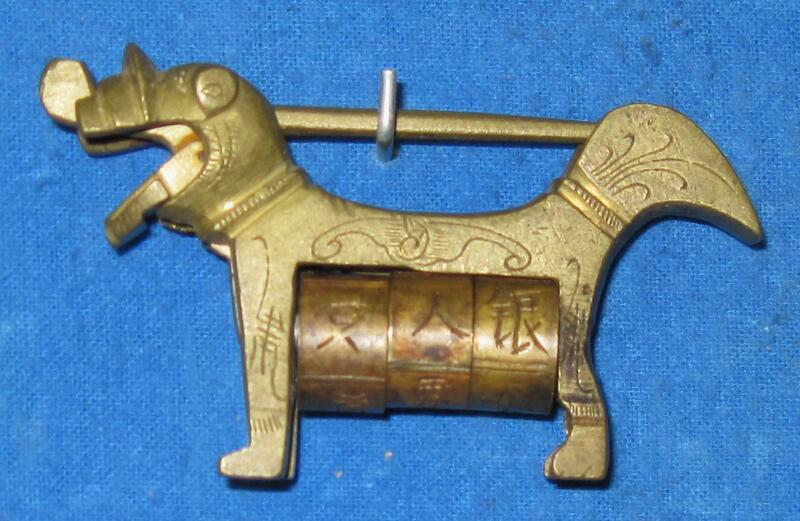 Padlocks in the form of Chinese zodiac signs (monkey, dog, horse). Figure 6. 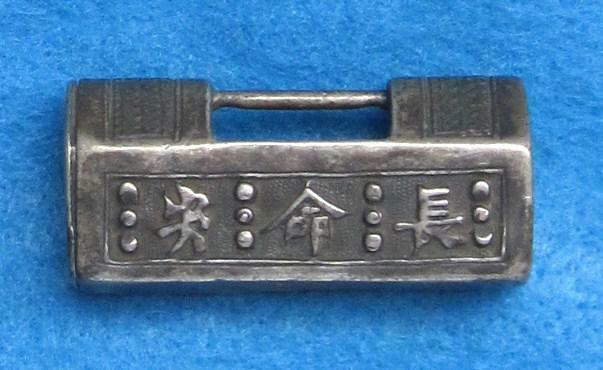 Figural padlock in the shape of Chinese word characters: wealth, long life, happiness, and good luck. Figure 8. 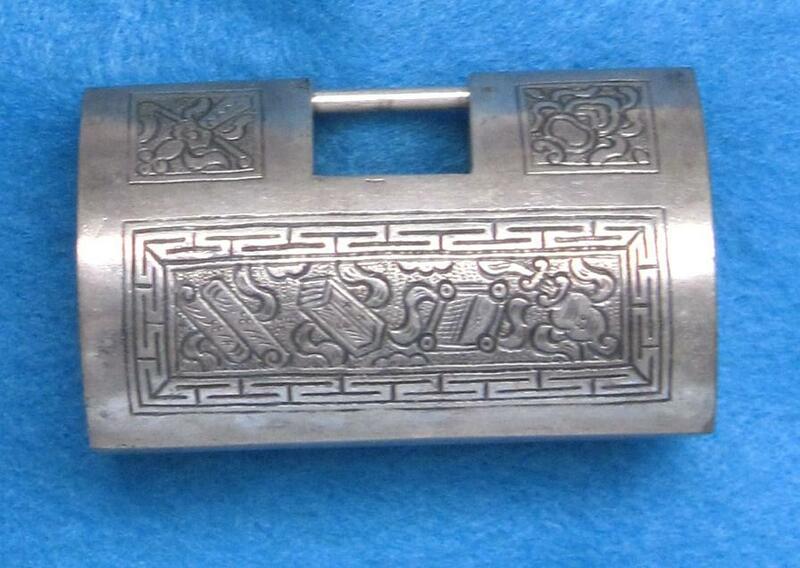 Older Chinese box style silver padlocks with embossed and engraved designs. Figure 10. 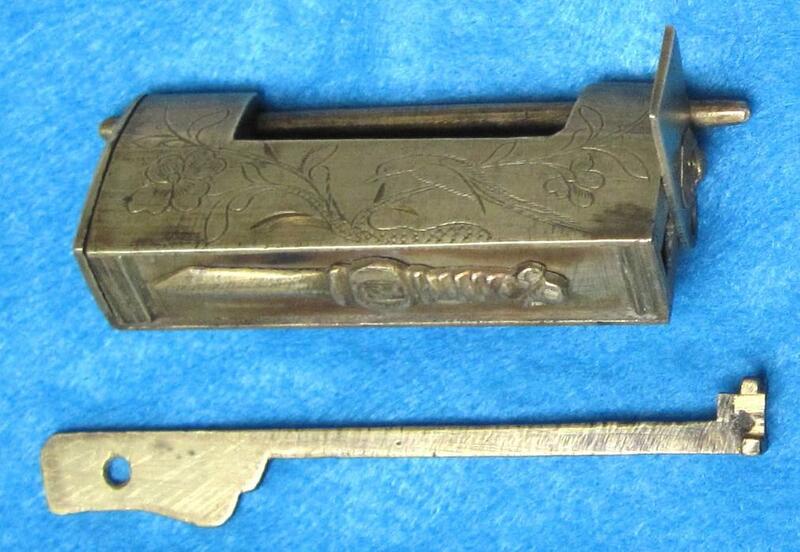 Decorated box style padlock with secret key hole & trick opening ( A. decorative rosette on one end is pushed down and end panel is swung out. B bottom panel is then slid out to reveal key hole. 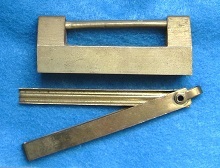 C. key can be inserted to open padlock). Figure 11. 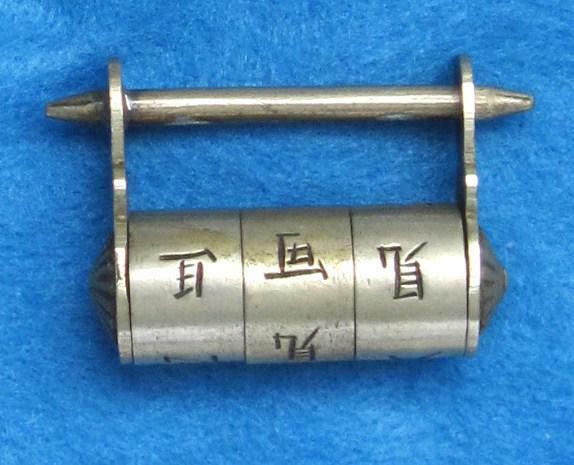 Chinese combination letter locks. Straight linear designs. Figure 12. 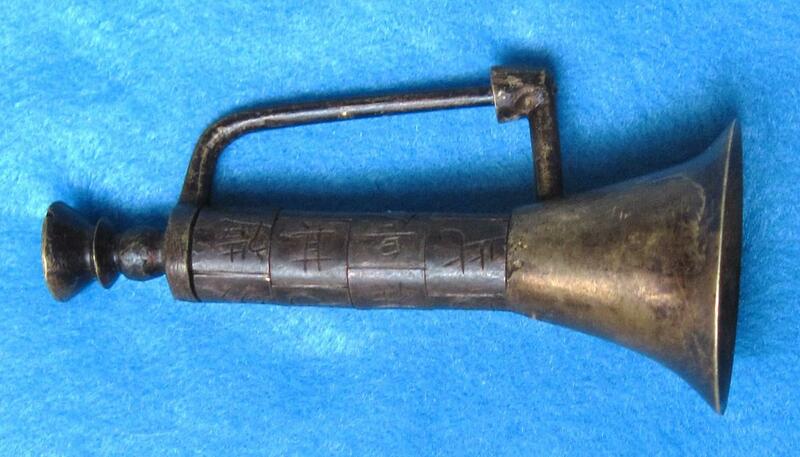 Chinese combination letter lock figural designs: Horn and Dog with movable jaw. Figure 13. 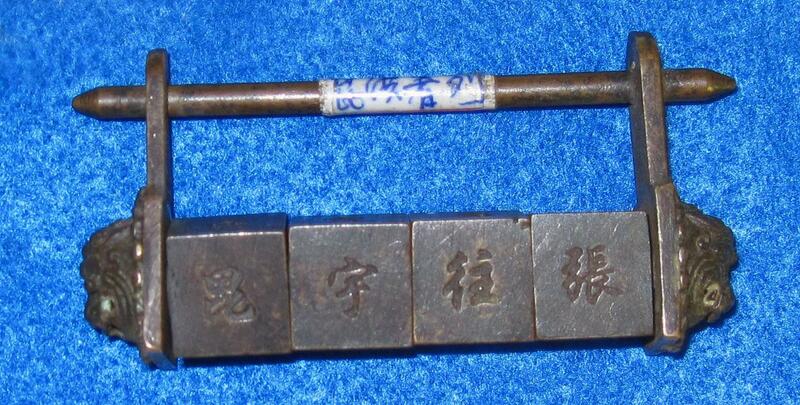 Late 19th or early 20th century Chinese combination letter locks made from nickel silver. Figure 14. 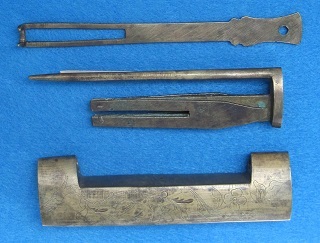 Late 19th or early 20th century Chinese leaf spring padlocks. Figure 15. Fine antique Chinese padlocks exhibited at the Hanns Schell Lock Museum, Graz Austria.